The Adams County Sheriff's Office is seeking assistance from the public in locating Jason L. Holsten DOB: 05/27/1979 M/W. The Adams County Sheriff's Office is seeking assistance from the public in locating Jason L. Holsten DOB: 05/27/1979 M/W who has an active warrant for Felony Bail Jumping. 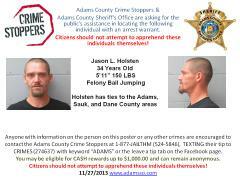 If you know the whereabouts of Jason L. Holsten please contact the Adams County Sheriff's Office at (608) 339-3304.